The best part of the fabulous Provincetown Carnival is without a doubt is the pre-parade when Commercial Street is packed with guys (and gals) just cruising up and down in the most outrageous and over-the-top inspired costumes that have taken the theme Mardi Gras By the Sea beyond our wildest imagination. The QUEERGURU team was there to record it all. Filmed by Dan Desjardins, assisted by Richard Bolton and Directed and Edited by Roger Walker-Dack. The Provincetown Carnival is organized by Provincetown Business Guild. 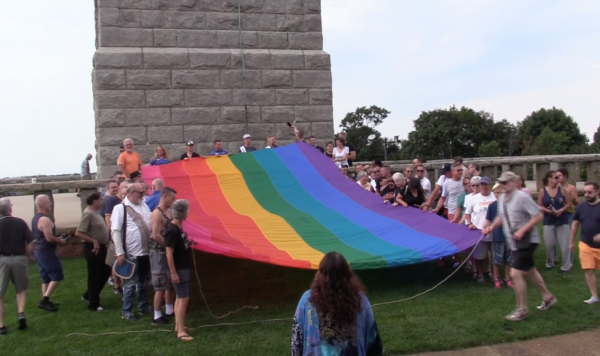 The official start of the Provincetown Carnival is the Flag Raising at Pilgrim Monument: queerguru‘s camera crew were there to film the highlights.